Nestled in the mountains on 19 private acres, this secluded Riceville vacation rental cabin is the ideal place to escape the hustle and bustle of city life! With 4 bedrooms, 3 bathrooms, arrangements for 8 to 10 guests, and elegant yet authentic cabin decor, this mountainside bungalow is sure to please! Whether you're in the mood for a tranquil escape or are seeking thrilling mountain adventure, make this trip one to remember by staying in this fantastic cabin! 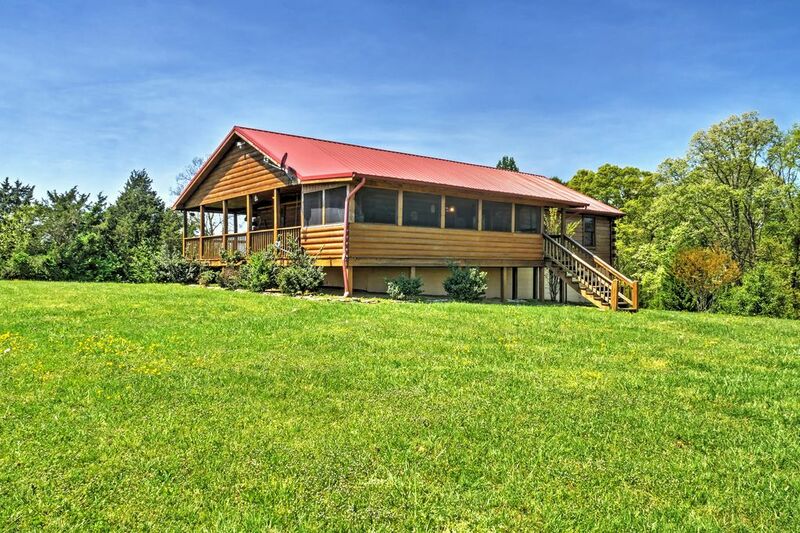 With 4 bedrooms, 3 bathrooms, and enough room to comfortably sleep 8-10 guests throughout 2,600 square feet of tastefully appointed living space, this rustic cabin is a terrific size and layout for families or a group of friends escaping to the Tennessee mountains. The cabin's all-wood interior is warm, inviting, and perfectly reflective of this mountainous destination. You'll find all the amenities you need to feel right at home here, including wireless internet access, central heating, and in-unit laundry machines for your convenience. After an eventful day outdoors, prepare your favorite meal in the fully equipped kitchen, or fire up the gas grill and enjoy a barbeque outdoors. You'll love spending your vacation evenings out on the wraparound porch, which surrounds 3 sides of the house and offers plenty of seating - it's the perfect spot to relax and admire the beautiful woodland scenery and distant mountain views! At nightfall, gather around the fire pit to roast marshmallows and gaze up at the starry sky. On chillier evenings, curl up by the wood burning stove while you watch cable on the flat screen TV. This wonderful log cabin will serve as your ultimate home base camp throughout your stay in Riceville. From here, you'll be within easy reach of countless outdoor activities such as fishing, mountain biking, kayaking, hiking, and hunting. The cabin is situated near many National Forests, including The Cherokee National Forest, as well as several river rafting companies, providing you with plenty to explore. The Lost Sea, an underground lake, is just 10 miles from the property and a great place to visit with your family. If you feel like venturing farther from the cabin, drive 45 minutes to Chattanooga, where you'll find Rock City and Ruby Falls. In addition, you'll be only 1 hour and 30 minutes away from Pigeon Forge, Dollywood, Splash Mountain, and Gatlinburg. Whether you're in the mood for a tranquil escape or are seeking thrilling mountain adventure, this delightful Riceville vacation rental home will not disappoint! - Only 45 minutes from Chattanooga and 1.5 hours from Pigeon Forge, Dollywood, Splash Mountain, and more! This house was absolutely BEAUTIFUL!!! The view was breath taking and the wrap around porch was the perfect place to take it in. We were in town for a family reunion and had more than enough room for our group. The house was very clean and well kept. I would definitely recommend this rental to anyone. Our family came together from Michigan for our daughters wedding. It was absolutely perfect. The peacefulness, the views, the home and all the rooms. Even the furniture made us all feel so comfortable. It was truly magical for us and we couldn't have found anything better. Thank you so very much! The cabin is comfortable and welcoming. We had 7 in our party and had plenty of room. The views from the wrap around porch are lovely. We saw deer and a raccoon...even heard roosters crowing. The location is private, but stores and the interstate are easily accessible. The kitchen lacks counter space, but is otherwise functional and stocked with the basics for cooking, including some staple pantry items. It looks like they plan to add an island because the light fixture is low and several of us had to duck so as not to hit our heads. Communication could be improved. I sent two emails to the company itself and two to the local contact, but did not receive a response from anyone. Thankfully, everything went smoothly and we didn’t have any issues that required their attention. All in all, it was a great trip and we would recommend it. We loved the home. It was very clean and well decorated. My only complaint is a slight gasoline smell when the basement door was left open. The garage is attached to the home so we assumed it was coming from there. Otherwise, everything was great. Very quiet and secluded property. A cabin located away from other properties. The guest contact was very responsive. He arrived within five minutes to answer my questions. Our group had a great time. The views were amazing. It was a little hard to find but we enjoyed the cabin when we did get there.